These findings come from a survey conducted from April 26-May 22 among 2,277 adults ages 18 and over, including surveys in English and Spanish and on landline and cell phones. The margin of error for the sample is plus or minus 2 percentage points. 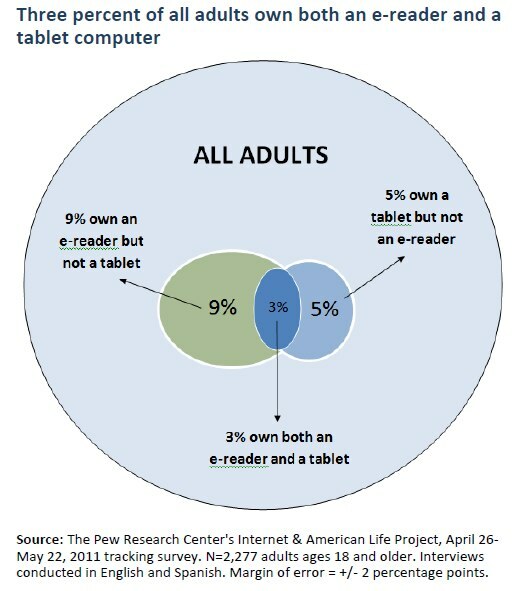 There is notable overlap in e-reader and tablet computer ownership – 3% of US adults own both devices. Nine percent own an e-book reader but not a tablet, while 5% own a tablet computer but not an e-reader. 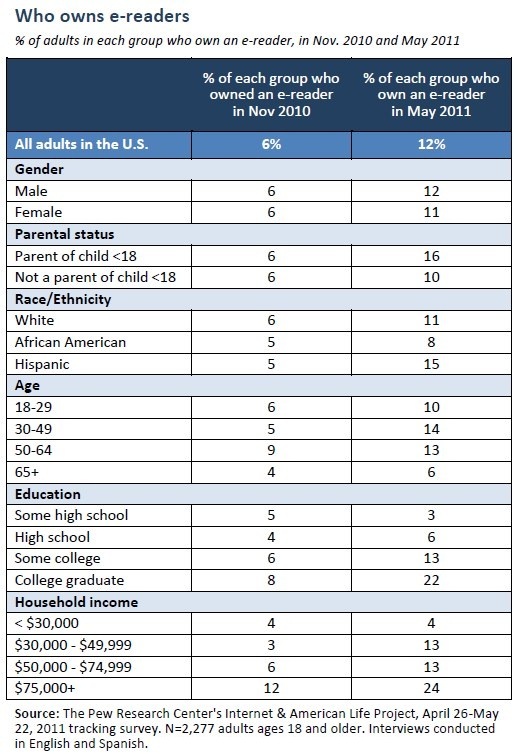 Further confirming the overall trend toward adoption of mobile devices, this survey marks the first time that laptop computers are as popular as desktop computers among U.S. adults. In November of last year, desktop ownership outpaced laptop ownership by 8 percentage points, 61% to 53%. This changing pattern is the result of both a steady decline in the popularity of desktops and a steady increase in the popularity of laptops over time. Laptops have already overtaken desktops in popularity among adults under age 30, and appear poised to do the same among older adults. Hispanic adults, adults younger than age 65, college graduates and those living in households with incomes of at least $75,000 are most likely to own e-book readers. Parents are also more likely than non-parents to own these devices. Some demographic differences have only recently emerged. For instance, in November of 2010, parents and non-parents were equally likely to own e-readers, yet in the past six months ownership of these devices among parents has grown more rapidly than it has among-non-parents. Similarly, e-reader ownership grew at a faster pace among Hispanic adults over that time period than it did among white or African-American adults. Moreover, ownership among adults ages 18-49 grew more rapidly than any other age group. 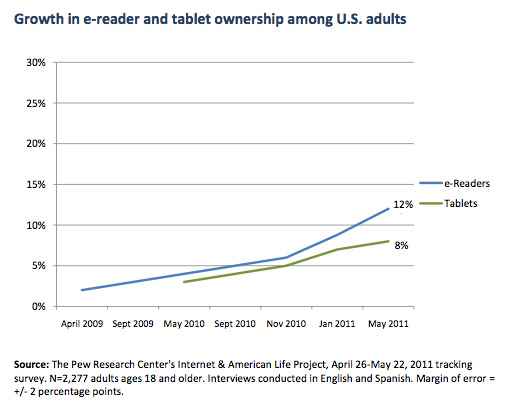 Other demographic differences in e-reader ownership are becoming magnified over time. There was considerable growth in e-reader ownership between November 2010 and May 2011 among college graduates, one-fifth of whom now own these devices. 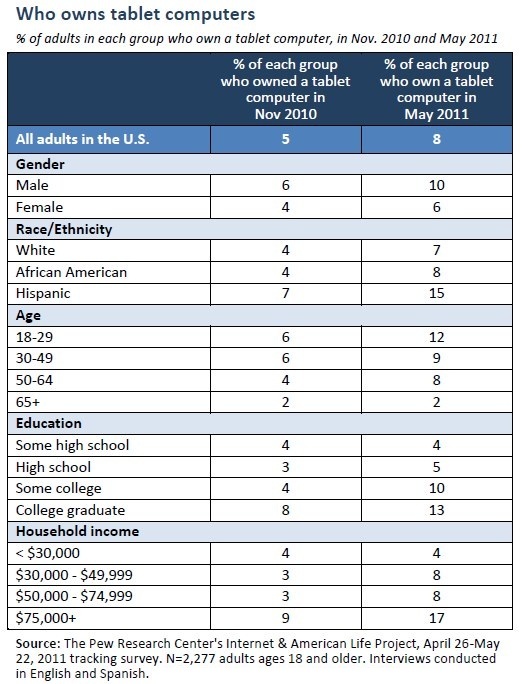 This group was already outpacing other adults in Pew Internet’s November 2010 survey. Similarly, while ownership grew across all adults with household incomes of at least $30,000 annually, gains were most pronounced among those in the highest household income category ($75,000 or more). As was the case six months ago, this group continues to outpace all other income categories by a wide margin, with one in four adults at this household income level owning an e-reader. 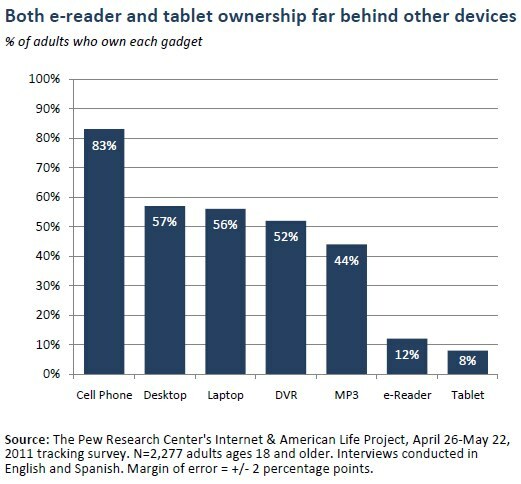 Similar demographic patterns of ownership exist for tablet computers, though parents are no more likely than non-parents to own these devices. However, in the case of tablet computers, men are now slightly more likely than women to own this type of device. Between November 2010 and May 2011, the largest increases in tablet ownership have been among men when compared with women; Hispanic adults when compared with white and African-American adults; adults 18-29; those with some college or college degrees; and those reporting household incomes of $30,000 or more. Overall, the highest rates of tablet ownership are among Hispanic adults and those with household incomes of at least $75,000 annually.